KoKo Lashes is an American company that sells some of the most sought-after fake lash styles. Celebs, bloggers, and social media enthusiasts all rave about KoKo Lashes, and in all honesty, it’s not hard to see why. With a collection of false lash styles that range from dramatic to softer, more natural looks – they also sell a range of accent lashes and lower lashes – there really is something for everyone. Whether you’re looking for a pair of every day falsies or the perfect party lash, KoKo Lashes have an amazing range to choose from. What we love about KoKo Lashes is that they are cruelty-free. Their lashes are made with high-quality synthetic fibers and human hair. If you like the sound of this brand, then you are probably wondering where you can find them. Read on below to find out. 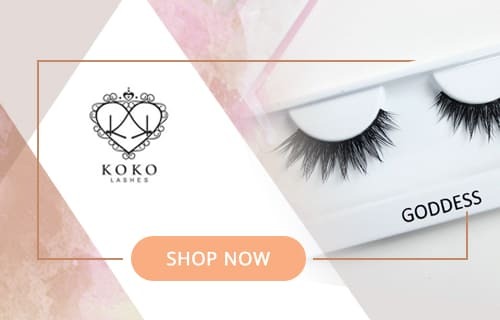 KoKo Lashes do not have their own online store, but they are available to purchase from a variety of online beauty stores. Lady Moss, The Palette Beauty shop, and Glam winks all stock KoKo Lashes. In addition, you can purchase them on eBay and Amazon. The KoKo Lashes selections available on Lady Moss are the most popular. If you want a discount, then be sure to look out for the KoKo Lashes coupon code which is offered by Lady Moss. Some of their best sellers are the styles Goddess, Soho, Misha, and Foxy. If you want to buy KoKo Lashes in store, take a look at Naka Cosmetics, Heaven and Hannah Beauty Lounge, and My Makeup Kit, all located in California. Fit for royalty, the KoKo Lashes Queen B style boasts layered lash strands that range in density, offering a textured, fluffy finish. With a full fanned-out appearance you can expect an eye accentuating curl. Ideal for achieving an ultra-glam appearance, the KoKo Lashes Goddess style offers a fun, flared design that will add a unique edge to your natural lashes. The graduated length elongates the eye which softens the look for more wearable volume. A combination of dense lash clusters that are blended with finer lash strands, the KoKo Lashes Amore style offers the ultimate volume and length for a dramatic yet tasteful look. A crisscrossed design featuring layered and dense lash strands that are formed together for a 3D effect, expect an extra intense look with the KoKo Lashes Stella style. Each lash cluster flares outwards giving a flawless, curled finish. 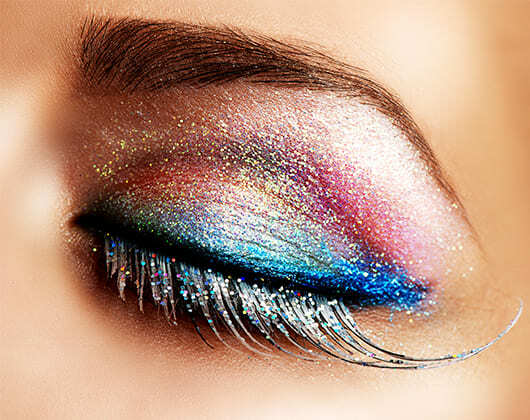 Provides a stunning, full and feathery texture and flare outwards for an eye-enhancing effect. The KoKo Lashes Misha style is medium in length with thick shorter clusters at the inner and outer corners of the eye and longer clusters in the center which ensures a gorgeous eye-opening effect. The KoKo Lashes Soho style is a very natural lash that is comfortable to wear. These look and feel like natural lashes. With some of the hairs scattered across the clear band in a cluster pattern, this style possesses beautiful volume. The KoKo Lashes Venus style is sure to enhance your look. They’re handmade and offer exceptional quality. Designed with bold lash clusters, the KoKo Lashes Risque style is created for an eye-enhancing effect. They are moderate in length and add some volume. The KoKo Lashes Demi G style is a fun and flirty lash that has a full appearance. These falsies have some length and are slightly longer in the middle to create a wide-eyed look. The KoKo Lashes Diva style is longer in length and also a lot more full. These lashes are wispy at the tips which adds stunning definition, and a flawless finish – ensuring they stand out. These luscious, layered falsies provide ultimate volume all thanks to the density of each strand. Expect a beautiful, full, textured look with the KoKo Lashes in the Foxy style. They have a slightly winged outer edge which elongates the eyes for an ultra-glam appearance perfect for girly nights out. The KoKo Lashes Marilyn style adds volume and length to the natural lashes. These have a criss-cross pattern and are longer at the outer corners to give a dramatic flirty effect. The KoKo Lashes Bella style is a beautiful lash if you are looking for volume. These are designed to create more volume around the outer corners of the eyes, making them a great choice for a night out. The KoKo Lashes Vixen style instantly gives your natural lashes some volume. These voluminous lashes are thicker at the base and tapered at the ends where you will find a blend of shorter and longer hairs creating a naturally gorgeous yet dramatic look. The KoKo Lashes Tease style is perfect for a “hot date.” It’s all in the name – these are sure to strike down the hearts of anyone who dare stands in your path. How Do We Rate KoKo Lashes? In all honesty, there’s not all that much information out there regarding the KoKo Lashes company, so we don’t have much to go on. But they are well-loved among customers and professionals alike. They are also a cruelty-free brand which we give them major props for. KoKo Lashes are well priced, especially when compared to high-end brands such as MAC. They have an average cost of between $4 and $8 which is very reasonable for a pair of falsies. You can also use a KoKo Lashes discount code to get an even better price. KoKo Lashes are loved for their quality. Most customers agree that these are some top-quality false lashes. With over 60 styles, you’re not short on options when shopping for falsies with KoKo Lashes. There’s something for everyone and for every occasion. KoKo Lashes are on par with most other brands when it comes to their durability. They can be reused at least two to three times, but can often be worn up to 15 times. KoKo Lashes are a pretty impressive brand, offering a large range of different style falsies suitable for any occasion. They are well priced and of a high-quality, ensuring that their customers only get the best. With an overall score of 94% we highly recommend KoKo Lashes for those who want quality, affordability, and variety, but aren’t as concerned with company reputability. Vixen pairs up perfect with winged black eyeliner and red lips giving a complete, sultry look. I often wear Vixen for this reason. Big fan of Koko Lashes overall. This is a really wonderful article, super concise. Helped me to navigate KoKo’s options a little better and I ended up going with the pair Bella. Happy with my buy. Bought Demi G a few weeks ago and gave them a test. They’re super soft and lightweight feeling and also not too overwhelming. I think i’ll consider buying more from koko lashes.